Poor Kirkgate. Leeds’s oldest street has been feeling a bit run-down and neglected these last few years (apart from a couple of gems like the Duck & Drake, of course). Which makes the arrival of Wapentake even more exciting. Taking its name from the subdivision of Viking counties (did you know Leeds was in the Wapentake of Skyrack? 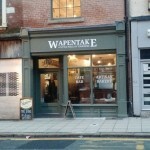 ), Wapentake is clearly celebrating Yorkshire. One of the two beer fridges inside is devoted to Yorkshire beers, and the food menu is full of Yorkshire items. In case you don’t know what a Wapentake is, there’s a handy sign. Wapentake isn’t a bar, exactly. It’s a deli and café as well, and even has its own bakery! 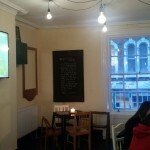 It’s open from breakfast until dinner and the menu includes perhaps the cheapest pub sandwiches in town at £2.50 a go. Some of the downstairs tables near the piano. But of course we’re there to review the beer. There are bottles from Great Heck, Brass Castle and Northern Monk as well as world beers including several Belgian ones. There are Yorkshire casks (Northern Monk and Kirkstall when we visited) and several kegs including a couple of awful ones to cater for Carlingites. The space is surprisingly large inside, spread across two floors. 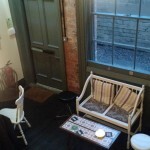 As well as sofas and a TV showing sports upstairs, there’s also a piano downstairs which is an unusual touch! 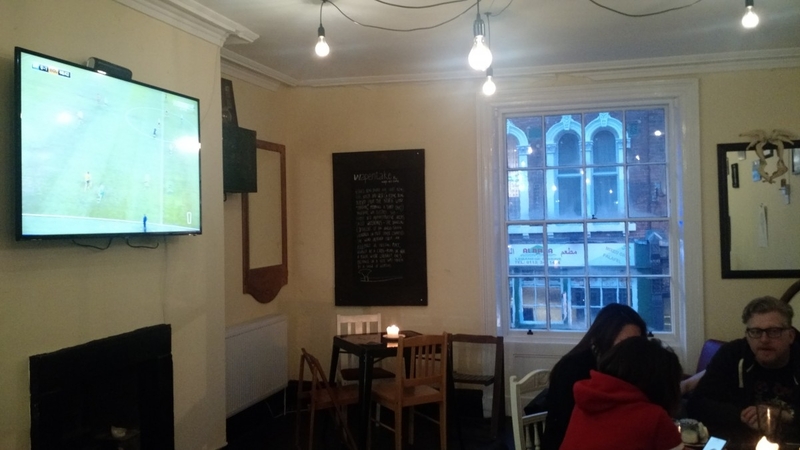 Sports upstairs. Not our thing, but also not distracting. 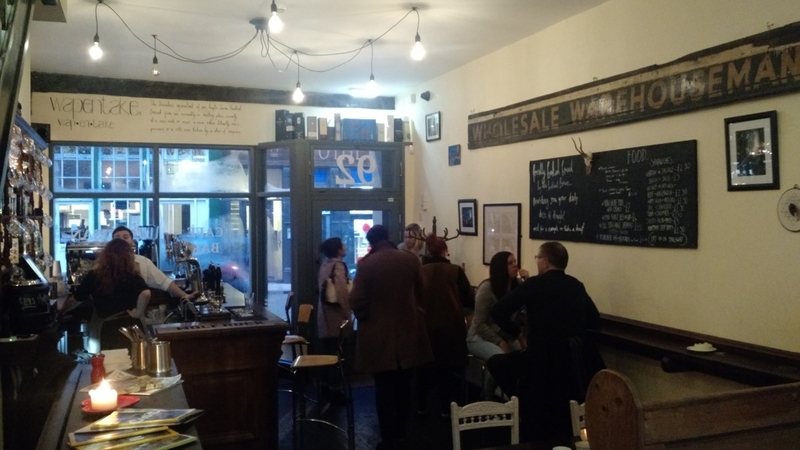 Often such a varied mix falls flat on its face but the attitude and enthusiasm of the bar’s two owners (who were both working when we visited) is what makes it: Wapentake is clearly about all the things they love and it works really well. 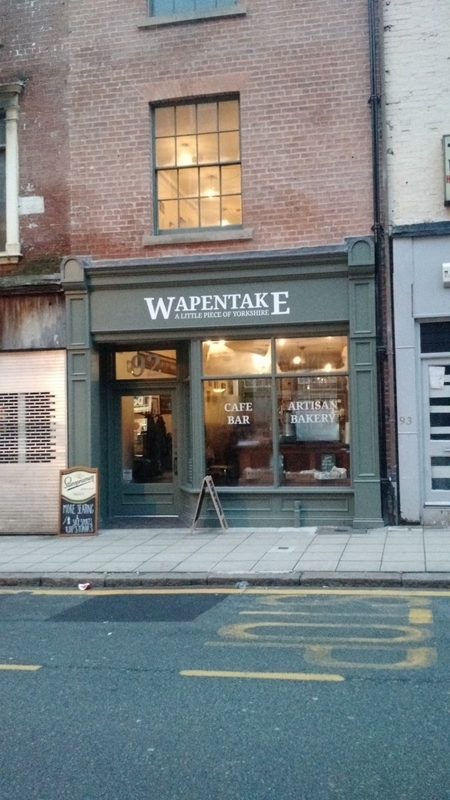 We can see Wapentake becoming a legendary Leeds establishment in the coming months. I agree, spot on. The place has just the right feel and succeeds by never being too crowded. It also doesn’t seem remotely interested in being a ‘scene’ place unlike Friends of Ham and BrewDog. The beer choice is well selected, and they are right to put on some cheaper beers along with the rest. 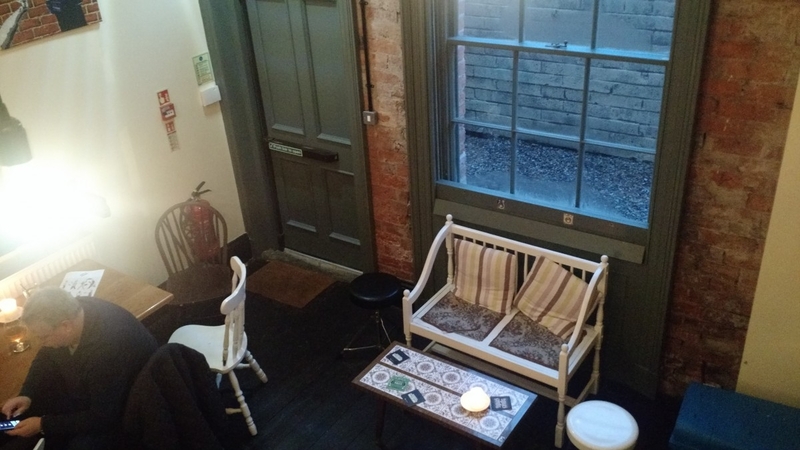 Service is pleasant and the courtyard is nice in summer. Long may it continue. 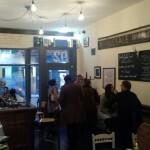 One of the best bars in Leeds, great choice of drinks and lovely food. Friendly staff, always feel more than welcome ! !